MARALEE MCLEAN is a child advocate, protective parent, domestic violence expert, professional speaker and author of PROSECUTED BUT NOT SILENCED: Courtroom Reform for Sexually Abused Children. . Maralee has written several articles for the ABA Child Law Journal, Women’s E-New and other publications on the problems of family courts not protecting abused children. Maralee is with Women’s Media Center (WMC), SheSourceExpert, NPEIV (National Partnership to End Interpersonal Violence) and is with RAINN speaker bureau, All American Speakers. She presents at conferences, law schools and is a spokesperson for protective mothers. Her passion for advocacy developed through living a mother’s worst nightmare. Fighting the system with body and soul, she gained the insight that this was not her nightmare alone. She organized a National Rally of Mothers at the Colorado State Capitol and has been involved in legislative work that spans over two decades. She testified before Congress to promote judicial accountability to better protect sexually abused children’s rights in our courts. Maralee’s story has been covered by many media outlets and internationally on CNN. Dignity: A Journal on Sexual Exploitation and Violence is an open access, peer-reviewed, interdisciplinary journal dedicated to publishing original articles on topics related to dignity, sexual exploitation, and violence. 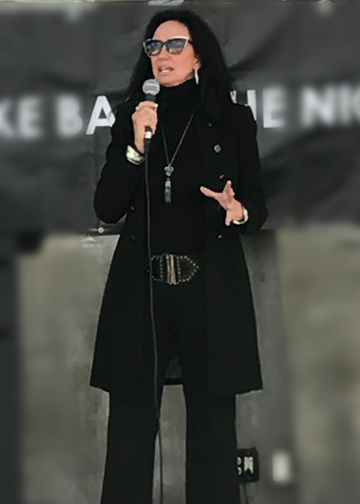 Maralee Mclean, our Director of Mom’s Fight Back Outreach is always on the move, creating waves and making a positive change in the world. Here, she’s pictured at an event with other changemakers: Mildred Muhammad who is bringing national attention to the awareness of victims and survivors of domestic abuse and violence; and Richard Ducote, one of the nation’s leading child abuse/domestic violence litigators and law reformers for the past 38 years.